A quick call to Claude Niek at CSO Yachts confirms that he's just sold Cortenzo's 26.22m motor yacht Familia to a direct client. Delivered as recently as 2008, she's RINA classed and MCA compliant, sleeping 10 guests in a master, two doubles and two twins. 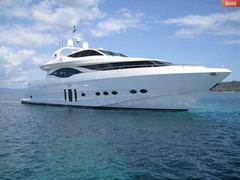 With a planing hull capable of cruising at 20 knots, she was asking €2 million and remains with CSO for charter.